Well, after an update schedule that makes that of The Venture Brothers look stable in comparison, I have finally completed season 9 of The Simpsons– the first in a four-part series looking at the Mike Scully Era. Truth be told, it was sorta what I expected. Character was indeed a bit haphazard, but that was mainly limited to Homer. Amazingly, this wasn’t too zany a season- there were a few wacky moments, but nothing too extreme. On one hand, I did expect the show to still be relatively decent, even in it’s weaker episodes. That proved true- the show was still largely funny, still seemed like it had something to say, etc. On the other hand, I expected a few duds. Indeed, there were quite a few duds- no major trainwrecks, but more than a few mediocre episodes. That’s what we’re covering here. Unlike other lists of this nature, for the most part, these will be listed in order of airdate. The exception is the standout bad episode of the season- it goes at the end. Oh, and please don’t refer to my reviews posted before February 2014. They’re boring and relatively poorly-written. One of many episodes this season that wasn’t memorable. As interesting as the plot could’ve been, it was a relatively boring episode in terms of execution. 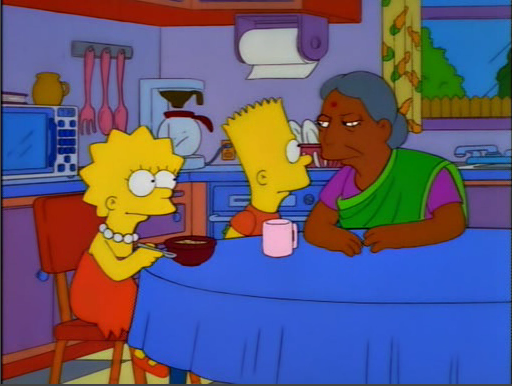 Having Apu married off seemed like a big change, yet I doubt it had a long-term impact on character development. I’d certainly watch this again, though- Andrea Martin and the late Jan Hooks did put on good performances. As funny as Phil Hartman is, something about Homer getting in a car chase with Snake bugged me a bit too much. I give it credit for it’s snarky take on the realty industry, but I remember comparatively little from this episode. There was nothing horrendously bad in this episode- some Jerkass Homer and some schlockness, but nothing wretched. Except for the humor – with the exception of the ending, it is a dull, color by numbers episode. “Liar Revealed”, other characters out of character for the sake of a cliche plot, and a dearth of humor all hurt this episode. The second of three episodes I would likely skip in a marathon. 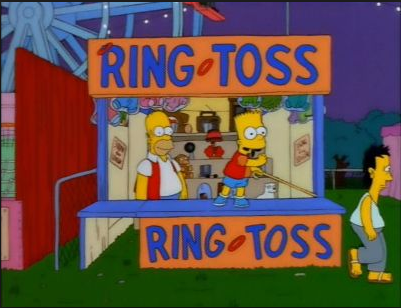 Basically, the episode can be summed up as “Carnies are jerks”. No substance. Oh, and Homer gets a job for a few minutes because. Boy, that’s a good sign. One of three episodes which, during a marathon, I would likely skip. What a waste of Jim Varney. As funny as the satire of extreme populism is, this is the quintessential Jerkass Homer episode- one where he gets a job and goes bonkers. Oh, and acts vindictive and whiny throughout. Thank you, Steve Martin, for making this more watchable. Homer survives horrendous drawbridge injuries, and makes a speech that seems to cement him as Mike Scully’s own Mary Sue- an invincible mouthpiece for the writers and their fantasies. It came at the expense of a plot with a lot of potential. Now, these were all pretty subpar. But, what was the most subpar? To clarify- what is the episode I am least likely to rewatch? Wow, was this pretty weak. The singing made little sense (or at least wasn’t funny), the clips reminded me of better episodes, there was virtually no comedy, very little character development… it was not memorable. Definitely one of the three episodes I wouldn’t rewatch- at least “Trillions” had some funny lines. Oh, and for clarification purposes, my three favorites (read, the ones I would be most likely to watch again) are, in order, Lisa’s Sax, Girly Edition, and The Joy of Sect. So, that wasn’t too bad. Not too good, but eh- you could chalk it up to first-season jitters… something which prior showrunners didn’t have, however. Here we are – Season 10. Starting whenever. Scullyfied Simpsons: Season 9, Episode 25: "Natural Born Kissers"
Nothing like your 11th anniversary to realize you have old cake in the fridge. Synopsis: It’s Marge and Homer’s 11th anniversary. However, recent events (such as having their anniversary dinner at a family restaurant) have them fear that the zest in their marriage has run out. While trying to get a motor for their freezer, the two get stuck in a muddy driveway in the middle of farm country. Hiding out in a farmhouse, the risk of the farmer catching them inside reignites the fire in their relationship, and the two realize that their relationship reignites when the risk of being caught in compromising situations increases. 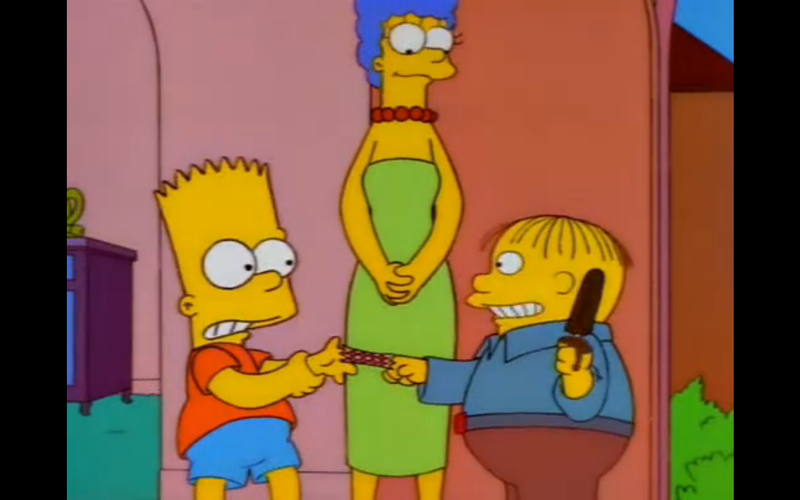 Meanwhile, Bart and Lisa find Abe’s old metal detector. After finding tons of junk, the two eventually locate a copy of an alternate ending to Casablanca. Let’s just say, the ending isn’t what one would consider a classic. Review: Shorter review than normal here, because there isn’t too much to dissect. Earlier episodes did the “zest in love life” plot better, added more pathos, more character development, and were funnier. It seems like this episode was just done to appeal to fanservice, as well as see how far the writers could “push the envelope”, and didn’t really bother to make that many other benchmarks in terms of quality. It’s amazing that, by the standards of the show, this was one considered one of the more “risqué” episodes. Remember- around this time, “South Park” was stretching the boundaries of what a cartoon could show. It seems like this episode was constructed as a response- a more risqué, envelope pushing episode. Nowadays, it’s a relatively tame episode. Strip away the more “edgy” content, and what you have is a rather pedestrian episode- Marge and Homer have a marriage crisis, a plot point which would be a cliche of the Al Jean years. If you want to be “edgy”, at least have substance. I don’t know- maybe 12-year-old me might have liked it because it was “edgy”, but with years gone by, I just feel like it’s a typical Scully-era episode- decent situation, zany buildup, zany ending. It’s far from the worst offender- it’s still a bit funny, and characterization was pretty decent, if milquetoast – but it’s not the most outstanding thing I’ve seen this show do. The message of the A-plot? Don’t break the law. It’s too much trouble for everybody involved. Strangely enough, I found the B-plot a bit more interesting than the A-plot. Bart and Lisa finding an old movie actually could’ve made for a decent A-plot in and of itself- sort of a remake of “Three Men and a Comic Book” meets “Lisa on Ice” meets “Day the Violence Died”. We could’ve seen some great character interaction between the two- something we really haven’t seen all season. Here, finding an alternate ending to Casablanca only allows for enough material for a B-plot, and with what little time it’s given, it’s executed very well. In fact, that plot showcases the satire aspect of The Simpsons more than the original. 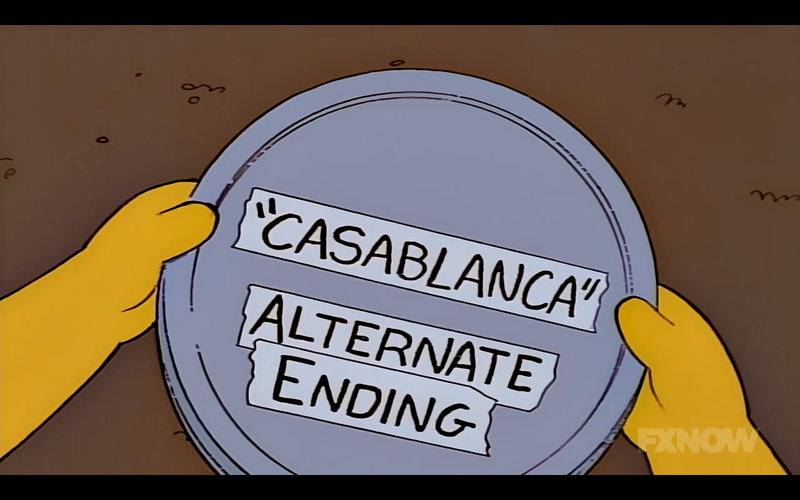 In trying to find treasure, Bart and Lisa come across an ending to Casablanca that is far, far happier than the one in the movie. It’s pretty clear that the ending is a spoof on the strict standards set for movies well into the 70s- movies like All that Heaven Allows, for example, had to slip their depressing messages under a thin cover of “happiness”. Casablanca is well remembered because it’s ending wasn’t happy, and it’s characters didn’t just stick themselves within archetypes, and the movie was more than just a simple romantic drama. Game, set, match for season 9. Next up for our trashing? Season 10. Gil’s back! Remember- he used to sell shoes? Now he sells cars… and can’t do that well at all. Methinks that’s going to be Gil’s character- an utter failure at everything he does. He probably wouldn’t have been used as much in later seasons if Phil Hartman hadn’t been shot. What a shame. I just love the look on Maude’s face when she notes Ned’s obvious golf advice. It’s the face that shows, as happy as their marriage is, there’s still some small differences between the two of them, rather than Maude just being a female Ned. I love those subtle moments of character… when I catch them. Zaniness Factor: 1.5- even with the ending, the episode is still relatively grounded. Favorite Scene: Nothing too outstanding in this episode, but I found the “Casablanca Alternate Ending” brilliant enough to get this award. Least Favorite Scene: Let’s face it- the second half of the A-plot was just an excuse to push the envelope. Oh, and Homer gets hurt a lot during that. Now, to end the season (and other seasons of Scully’s era of The Simpsons), I’m not going to do a traditional “wrap-up”. Rather, I’m going to include that in a “Not Another Top (X) List” post. That post? 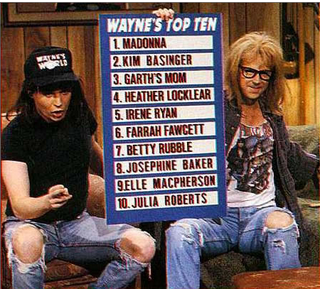 The 9 worst episodes from Season 9. Scullyfied Simpsons: Season 9, Episode 24: "Lost Our Lisa"
Synopsis: Lisa’s attempts to go to a museum exhibit crash when Bart does something stupid with props and glue. (Surprise, surprise.) Marge is not a fan of Lisa’s proposal to take the bus… so she gets approval from Homer. 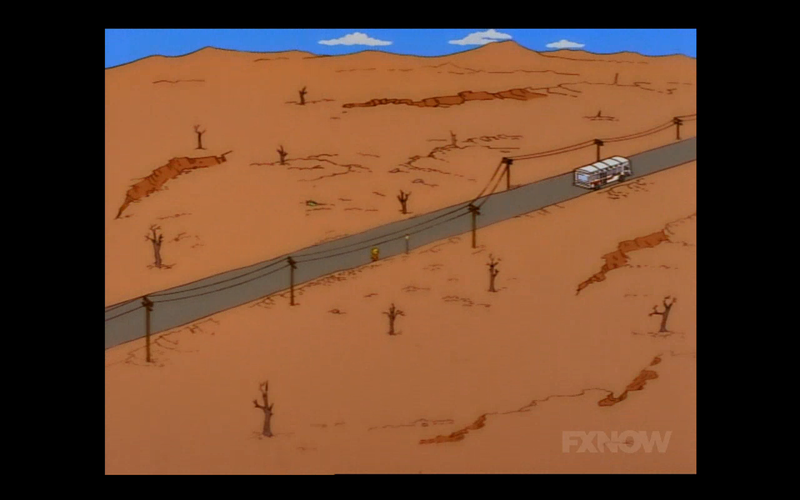 However, Lisa didn’t look at the bus schedule and winds up in the middle of nowhere. It’s up to Captain Wacky to rescue her! Review: This episode, in my opinion, is just a weaker version of “My Sister, My Sitter”- Lisa tries to get out of potential trouble with her parents. However, whereas that episode had damn good pacing, a great setup, and believable characterization… this episode has Homer hijack the plot so that a drawbridge can close on his head. Yes, the first part of this episode is Lisa… TAKING THE PUBLIC BUS! THE HORROR!! THE HORROR!!! Actually, the bus system in the United States is actually a tad bit more confusing if you’re not inside a major city. I mean, have you seen the Suffolk County Transit bus system out here on Long Island? Not exactly straightforward… nor is it as point-by-point as it is in New York City. Marge’s concern is pretty damn realistic… and guess what, she was right! Lisa winds up in the middle of freaking nowhere! Actually, this is somewhat believable characterization for Lisa. Sure, she’s a brilliant intellectual who might be the sanest in the family. However, when you think about it, she makes decisions that can be utterly brash and insane. There was no need for her to look at a bus schedule, and it came back to bite her. I actually felt like this episode could’ve been a decent, if well-trudged through, character analysis for Lisa. Is she really as mature as she appears to be? We’ve seen her go to cruel lengths in “Girly Edition”, and here, she seems hell-bent on going to the museum, no planning, no consideration of the consequences. Still, it’s a Scully-era episode. This, of course, means that they have to stuff Captain Wacky into the plot somewhere. That’s the problem that seems to dominate the second half of the second act, as well as the first half of the third. Homer leaves work, tries to find Lisa, and proceeds to suffer only minor injuries from otherwise mortal wounds. He drives through a bunch of planks. A drawbridge crashes on his head. Cars run over his skull. On one hand, he appears to suffer no damage, barring some tire tracks on the top of his head. When Lisa vows she’ll never take a stupid risk ever again, Homer slams the brakes and informs her otherwise, claiming that stupid risks make life worth living, and that’s why he has so many crazy adventures. So yeah, instead of being an average American man who has dramatic and absurd scenarios befall him (which is part of the reason why they’re funny), now he’s Captain Wacky, actively doing stupid things on impulse. It’s astounding how jarring this scene is; even Lisa in-universe seems kind of perturbed by her father’s statements. Homer loves the thrill of adventure? […] His whole diatribe is almost like his new mission statement, as from this point on he’s pretty much always up to some wacky hijinks, a fractured caricature of his former self. Mike Amato is pretty spot-on with his assessment, so I’ll just build on it a tad bit. Now, in the writers’ defense, Homer has a point. Sometimes, you do have to take certain risks- you shouldn’t be milquetoast. I also think he might have been coming off the “rush” he got from almost dying- thus, having a slightly different outlook on life. The problem here is that besides coming at a time when the character was “evolving”, we have to remember that this speech was given by Homer. There was no reason for it other than the writers found that Homer was available. To me, this is the moment when Homer began charging full-steam to Jerkass Homer-ville – one where he did whatever impulses or fantasies the writers had because they’re awesome. Now that I’m done railing against that, I must admit that Homer is actually relatively sweet here. He goes to rescue Lisa, and despite almost dying, he and Lisa get to spend some quality father-daughter time together. It’s actually a pretty sweet ending. It’s a cute episode, indeed, but one with a flaw that just seems too much like a bad omen of Jerkassery and Zaniness. Uh… Lisa wants to go see a bunch of artifacts from Egypt. The title of the program? “Treasures of Isis.” That might come off as a tad bit awkward to those that don’t read up on their history. Personal note: I never encountered a “split weekday schedule” bus – Suffolk Transit only does Weekdays and Weekends. One more note: the “Not What He Seems” review won’t be up until probably the end of the weekend. 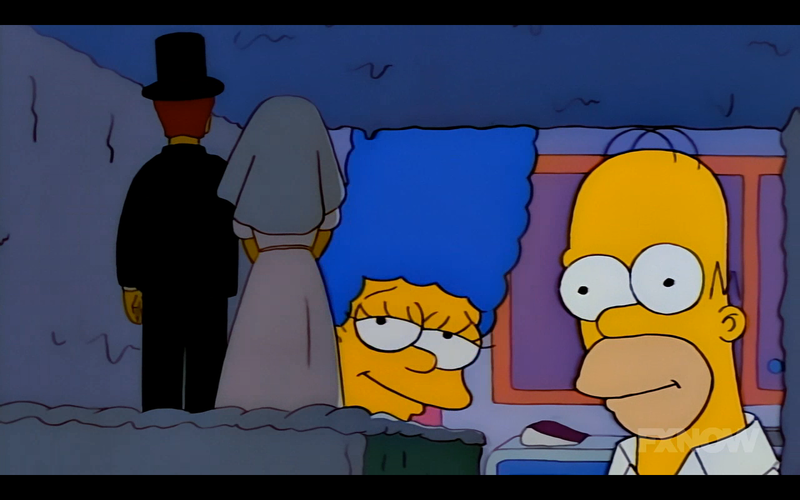 Favorite Scene: There’s something particularly heartwarming about Lisa and Homer at the end of the episode. This show still has a bit of heart left. Least Favorite Scene: Homer getting a drawbridge closed on his head… not so much. Zaniness Factor: 3. Homer getting all those injuries and surviving? This is a cartoon now. Jerkass Homer Meter: 2.5, only and only for his “risk” rant. It isn’t so much “callous” as it is “out of character”. Scullyfied Simpsons: Season 9, Episode 23: "King of the Hill"
Synopsis: After a disastrous outing to a church picnic, Bart realizes that Homer is pathetically out of shape. Homer, disappointed in himself for failing his son, decides to take up an exercise regiment, complete with trips to the “gyme” and eating Powersauce bars. Impressively, with the help of Rainier Wolfcastle, he manages to build up sizable muscles within two months, albeit developing a bit of ego along the way. One particular trip to the “gyme” has Homer and Bart meet up with representatives from Powersauce, and Bart convinces Homer to take up on an offer to climb the super-tall Murderhorn. 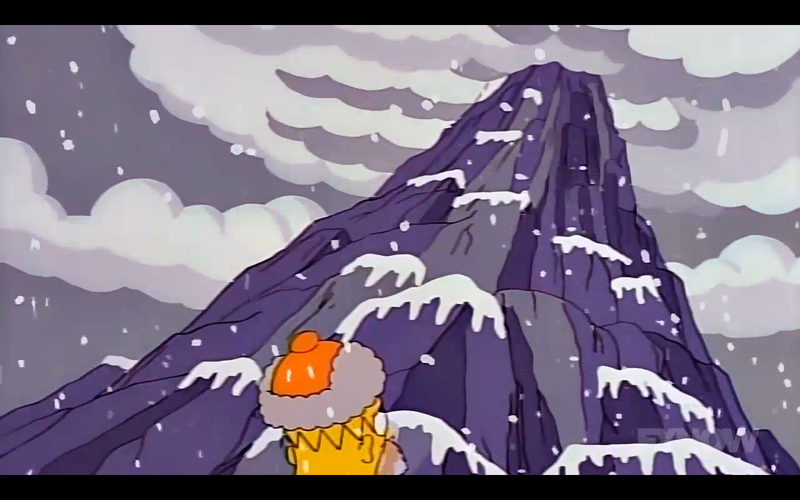 The executives sponsor the trip along the way, turning it into an ad campaign… even having sherpas help Homer. This episode chooses to look at one of Homer’s defining physical features- his rotundness, and how it contrasts to society’s expectations of machismo. It’s a bit strange that, given the relative zaniness of these past few episodes (Cuba? Really? ), this episode actually has a somewhat realistic portrayal of Homer’s health and what happens when he exercises- even though he gets muscles in two months, he’s still not presented as fit. The way this episode portrays his strives to get healthier actually makes you feel for Homer through the entire episode. Unlike future episodes, which will show Homer become macho thanks to the power of a dietician, this episode shows the fraudulence of certain “schemes” to healthy living- that is, food in “health bar” form. This actually shows a realistic viewpoint of that scheme- eating the bars seems to motivate Homer. When the rug is pulled out from under Homer (mmm… Chinese newspapers), he rejects the Powersauce Executives fears that he won’t make it to the summit… only to embrace it after almost dying. He only truly abandons his quest after he learns something about his father. Why? Eh, it’s a plot arc introduced in the third act. I would’ve placed something a bit earlier, but it fit with the pacing of the episode. Still, he realizes that there can be no greater shame than what his father did, and that whatever he does is still more dignified. I won’t spoil it, but it is a pretty dark moment. While Homer does dip in a little bit of “Jerkass” territory here, it’s relatively minor and somewhat excusable- with the pathos built up, it’s understandable why his ego inflated a bit after gaining some muscle. Likewise, the resolution of the plot is a bit… strange. Still, somewhat alleviated by Homer’s pathos. Getting back to the macho part, this episode does take some shots at society’s expectations of macho-ness via Wolfcastle. The muscles. the feats of strength. Yet, he won’t do the impossible in real life- climb the Murderhorn. Granted, his reasoning is justified, but still. The Gravity Falls episode “Dipper Vs. Manliness” did a similar episode 15 years later- one that criticized masculine stereotypes. Being that “Manliness” happens to be one of my least favorite Gravity Falls episodes, I find it strange how an episode from the waning years of The Simpsons can best a similar episode of a show which might be my all-time favorite. Not much to say here, really. A good episode, albeit relatively unmemorable (except for “gyme”), probably the last before Scully’s brand of Simpsons fully takes over. The mockery of advertising is brilliant. The Powersauce executives are annoyingly hysterical- they’re more callous about death and danger than Mr. and Mrs. Valentino! This just in: Powersauce is amazing! Note to self: always use “gyme”. Apologies for being out for these past couple of weeks. Writer’s block, plus a new blog, plus a new semester, does not motivation make. One last note: this will likely be the last blog post under the current URL. At the latest, as of the posting of my review of the next Gravity Falls episode, “Northwest Mansion Noir”, the URL will change to starbug1729.blogspot.com. I would preemptively bookmark it, if I were you. Favorite Scene: Every scene with Abe and McAllester is brilliantly done. Nothing says character development like those scenes. Least Favorite Scene: Eh… can’t name a scene that stood out for it’s weaknesses. All of them were necessary to the plot. Jerkass Homer Meter: 1.5. Homer gets a bit more aloof and callous when he gets fit, but it’s immediately balanced out by the pathos in the episode. Zaniness Factor: 2… mainly for the last three minutes. Cassandra: …who will be dead in 20 minutes. Synopsis: After OFF celebrates “Love Day” (a second Valentine’s Day meant to make more money for big business), there is a heap of trash. Failing to get the trash out in time, Homer insults the garbage men, causing service to be cut off. Weeks and piles of trash later, Marge finally writes an apology letter. 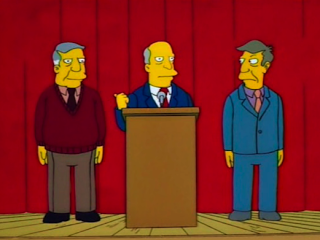 Rejecting this claim, Homer goes straight to the top – Sanitation Commissioner Ray Patterson (Steve Martin), and after getting thrown out, decides to run for Sanitation Commissioner himself. Running on a populist platform of “can’t somebody else do it”, he wins in a landslide… and his policies threaten to bring down the town. *WARNING: SPOILERS IN REVIEW”Review: Great. Right out of one of the better episodes of the season, we get an episode that showcases probably the most blasted aspect of Scully’s era- mischaracterization of Homer Jay Simpson. And this is the two hundredth episode. That’s a good sign, eh? Actually, taken as a whole, this episode seems to continue with the satire found in “Girly Edition”- picking apart an aspect of American society. This example is somewhat more over the top than “Girly Edition”- this time, we take a look at the pitfalls of populism. American society is practically built on pseudo-populism. It was a bunch of “average joes” that drove the British Empire out of the land now part of the United States of America. America was one of the earliest “modern’ (read- post Renaissance) nations to experiment with a representative democracy, and a head of state that was from the people, not a monarch. The anti-federalists, representing the populace, managed to get a Bill of Rights in the constitution, guaranteeing basic freedoms for the people. Unfortunately, populism has it’s drawbacks. Given that the average joe is often less aware of the risk factors when it comes to certain ideas, their plans can often end in disaster. For one, you can’t expect low tax while maintaining the same level of public services- you either have to cut services or raise taxes. Often, people believe that everything should be done to their exact beck and call, and that they shouldn’t have to pay the piper. This episode sends up those populist ideals- Homer runs for sanitation commissioner, wins on his populist ideals, tanks the budget on his wacky plans within a month, doesn’t think to ask for a budget increase, and ultimately trashes the town. Thing is, this episode seems like it was “plot first, stick characters wherever second”. Homer was the centre character- they stuck him in. It’s pretty awkward. 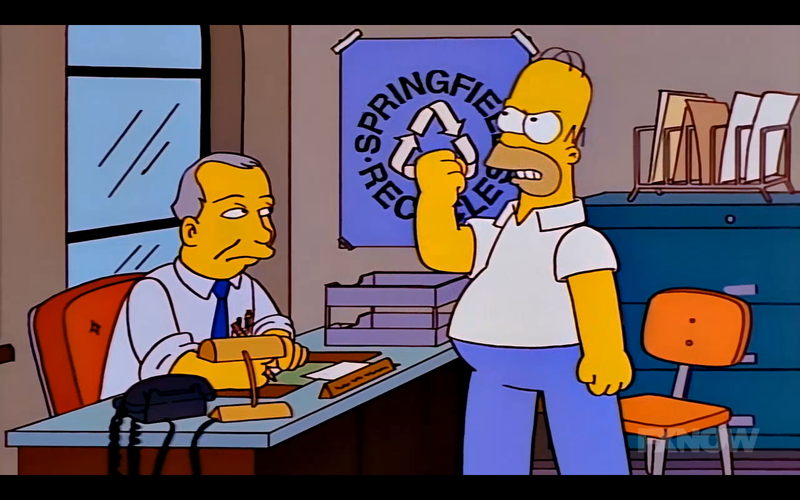 It’s hard to see Homer get this arrogant, this angry, this active. His behavior during the campaign is brazen- cutting Patterson’s brakes? Yet, the town (and freaking U2) spontaneously break out into song about how his administration is going to be awesome… I think (I’m not sure if it was a dream by Homer). On one hand, this could be seen as a mockery of the overt populist ideals exhibited in American society. Yet, I can’t see Homer putting this much effort in political participation, and being this callous in doing so. It seems like everybody eggs on his behavior a bit too much- even Lisa doesn’t stop Homer from the fateful trip to City Hall. Granted, the town is populated by idiots, but it still stretches believability. Thankfully, there is actually a realistic backlash- the money is blown through rapidly, Homer’s plan to make money back fails, and he is deposed. Oh, and he’s not a mouthpiece for the writers. Yet. Ray Patterson is actually one of the more confusing one-off characters that the show has had. He spends the episode blasting the extreme populism that Homer exhibits, and the fact that people are cheering him on. Once all is said and done, he high-tails it. On one hand, he’s pretty damn sympathetic, as well as hysterical. On the other hand, it seems to be a recognition by the writers that Homer’s becoming this “centre of the universe” character, and that they don’t really care. The middle of the third act also shifts the show from a political satire to a “green” episode. It’s not too over the top, but it’s still a bit jarring. It does seem like the writers forgot where to go, and pumped in the last few minutes just to bring everything to a conclusion. Admittedly, the comedy in the episode is good enough to downplay any potential flaws. Examples? The concept of Love Day itself. Board member is fine with a dip in sales during the summer… and is promptly dragged out. During their stop at the PopMart tour, U2 plays “Pride”… as Homer gets dragged out of the concert and beaten up. This is broadcast on the mega-screen behind U2. The Simpson family instantly thinks Homer’s plan to replenish the sanitation budget involves drugs. It does – drugs and weapons are brought in from New York City. Cue the “Sanford and Son” theme as he washes his hands of the situation. Plan B. Zany, but shocking enough to be hysterical. Still, besides the comedy, the flaws in this episode are a bit hard to look past. Too much annoying Homer, the buildup is a bit far-fetched, and both of these combined makes this episode a bit of an “off” viewing experience. Steve Martin’s delivery as Ray Patterson is fantastic. I think he might be the best guest star in the Scully era. Granted, we have three more seasons, but I got a bad feeling about them. U2, on the other hand, just seem to be in this episode to get “down with the kids”. Bono’s faux-pandering to Homer is funny, but the scene just seems superfluous. Note to self: whenever somebody says something stupid, play “Fur Elise” in my head. (Added as of 30 May): Fun fact: the city of Toronto once wanted to turn an abandoned mine n Northern Ontario into a landfill for Toronto’s stuff. Socialist leaning city councillors Jack Layton and Olivia Chow played this episode to the council, and they eventually reneged on their decision. Jack Layton would go on to become the leader of the socialist-leaning NDP, taking that party to their largest federal victory ever. Layton himself called the show “the single most important influence on progressive social commentary in the world”. Remember, this was back during the more “third-way” 90s. Zaniness Factor: 3. Would’ve been a 2, but the last minute is bizarre enough to push it to a 3. Jerkass Homer Meter: 3. Would’ve been a 4, but he gets punished appropriately enough. Favorite Scene: Anything with Ray Patterson. Least Favorite Scene: I like U2 as much as the next guy, but their scenes were pointless! 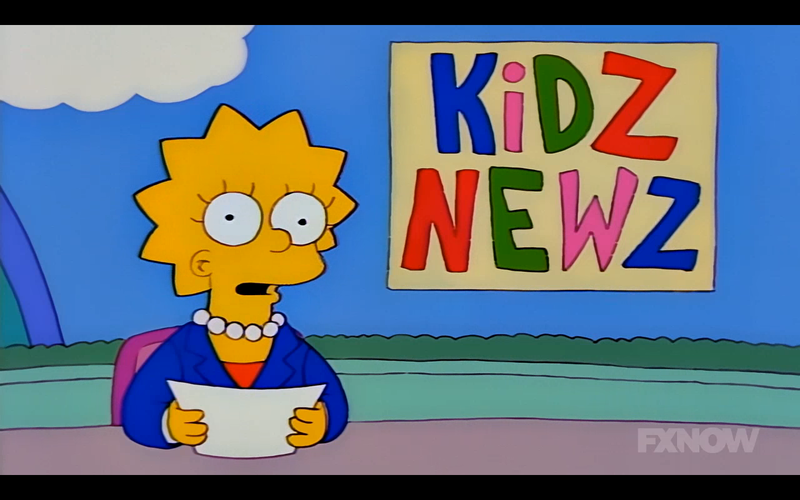 Scullyfied Simpsons: Season 9, Episode 21: "Girly Edition"
Synopsis: With the FCC cracking down on educational TV, executives convince Krusty the Clown to add a ten minute news program hosted by kids to the end of his shows. Lisa and Bart are appointed as anchor and sports anchor, respectively. Bart’s goofy delivery impresses the executives more than Lisa’s straightforward delivery, and he is promoted to co-anchor. After hearing Lisa’s complaints about him, and after a brief consultation with Kent Brockman, Bart decides to go into more of a “sentimental” route, much to the chagrin of Lisa. Meanwhile, Homer adopts a helper monkey, Mojo, to help him with his busy life- that is to say, getting food and sleeping. Marge is not amused. Review: Now THIS is what “Trouble with Trillions” could’ve been: a satirical look at a particular organization or institution. In this case, the writers decide to take a huge bite out of the modern news media and traditional media in general, and it’s brutal enough to obscure any flaws that this episode has. Let’s face it: with news fatigue and “social” news media on the rise, traditional outlets have to play the “tabloid” game even harder to try and retain viewers. The American news media does this especially egregiously- FOX News and the New York Post spin to the right, MSNBC spins to the left, CNN targets the lowest common denominator. It’s all in the quest for viewers- many of whom have simply stopped caring. At the same time as this episode was being produced, the FCC cracked down on children’s TV shows on the networks. Believing that kids were getting stupider and fatter as a direct result of Ninja Turtles, the FCC began requiring that broadcast networks air three hours of “educational” TV. Basically, as long as it carried a message at the end, it got approved. The reason why this failed? Not only were kids just rebelling to cable TV, but strict advertising regulations made producing shows a loss for the networks. This episode manages to hit two birds with one stone- exploring just how weak and phoned-in “educational” kids TV can be (hear me, Litton), while also taking a stab at the news media for covering “soft” news and sensationalism over hard news… even if it meant putting those that work for these companies in danger just to maintain their jobs. As for characters… I actually can tolerate some of the characterization being a tad off… this time. In fact, I can’t say character here is too far off. One of the chief complaints against this episode is that Bart isn’t “proud” of being an underachiever here- he actually responds seriously to criticism. Yet, his response is far from genuine- it’s just an attempt to garner sympathy and prestige. That’s what American news media is, eh? Laying on the schmaltz and the flamboyance to get ratings. Lisa, meanwhile, is often viewed by newcomers to the show as eons wiser and calmer than Bart. Episodes like these show why that viewpoint isn’t exactly correct. Sure, Lisa might be wiser and calmer, but the prospect of being one-upped brings out the absolute worst in her… and makes for some excellent character scenes. She’s far from irredeemable, shown when she comes to Bart’s defense at the junkyard, but the scenes where she sets Bart up for failure show a brilliant sense of short-sightedness in her. This episode marks the second appearance of Lindsay Nagle. Nagle works best as a symbol of the callous executive- one that tries to stay hip, and one that likes the money, product be damned. (Ironic, innit?) Later episodes have received flack for overusing the character- a sign that the show’s well of ideas was on empty. We also get our first appearance of the Crazy Cat Lady. Not a lot to work with beyond a joke or two, as funny as those are. For some reason, they gave her some episodes that tried to develop her character (running for mayor in “See Homer Run”, getting a backstory in “Springfield Up”, and injecting some pseudo-pathos in some Season 22 episode that I don’t remember), and the results were underwhelming. But enough of that noise – let’s go to what everybody remembers about this episode… Homer getting a pet monkey! It’s cheesy, full of Homer acting like an insensitive child, and just hysterical. You see, Homer’s just childish enough to be lovable here- a limit that appears to have been overstepped in recent years. Seeing Mojo deteriorate under Homer’s “care” is pretty dark, yet is also hysterical. “Pray for Mojo”, indeed. Overall, if this is the show’s last “above 7” episode, I’m not going to complain too much. Just wondering- how did Bart avoid punishment for effectively stealing half a shipment of Creamed Corn? Here’s the deal- Season 12 has an episode that sends up the British sci-fi drama The Prisoner. I’m not too worried about it, since at the pace I’m reviewing The Simpsons, the show will finally be cancelled. Still, I’m thinking that, during the 17 episodes before “The Computer Wore Menace Shoes”, I’ll also post reviews of The Prisoner alongside those reviews. If that goes through, expect the first Prisoner review to go out with “Faith Off”. Jerkass Homer Meter: 2. No matter what, dragging his father in to get a monkey stretches the character’s likability, even by Scully’s standards. Favorite Scene: Mojo steals donuts, and proceeds to hoard them. No wonder why Homer developed a callous to his health, and was relatively unmoved by dropping him off. Least Favorite Scene: OK, I’ll admit that Lisa’s speech at the end of the episode was pretty over the top. Scullyfied Simpsons: Season 9, Episode 20: "The Trouble With Trillions"
Synopsis: The IRS notes some minor discrepancies in Homer’s taxes. (Read: Homer waited until the last possible second, made egregious claims, stuffed them into a manilla folder, and tried to sweeten the deal with mint candies.) Threatened with five years jail, Homer instead accepts a plea- work for the IRS to capture tax cheats. 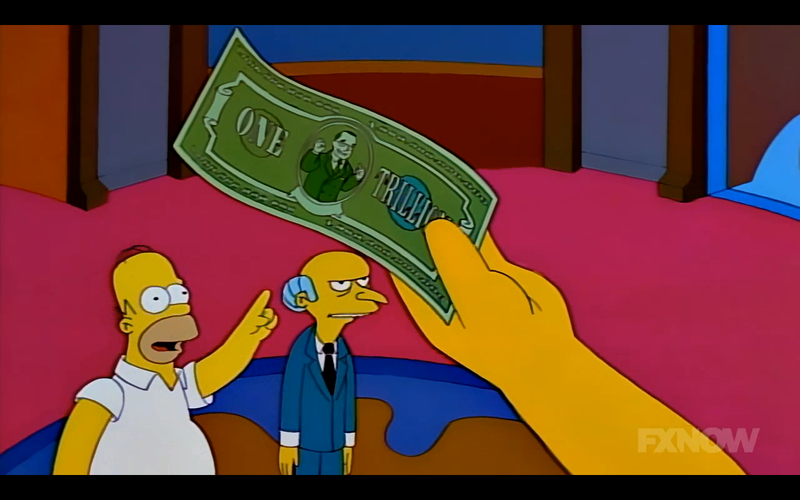 One such tax cheat is Mr Burns, who the IRS alleges took a trillion-dollar bill meant for European reconstruction post WWII. However, Burns’s critique of the government resonates with Homer, and the two (plus Smithers) flee. Forced to escape the country, they decide to hang out on an island… one called Cuba. Review (SPOILERS): The IRS here in the States is a government entity that is ripe for comedy. Americans have always had a skepticism of taxes, and that lends credence to the IRS being the least-liked bureaucracy of the US government. Mocking them by being a bunch of crooked spies who manipulate the system for their own gain would’ve made for an awesome episode. Unfortunately, this episode let’s that potential go to waste. Instead, we get a standard “Homer gets a job” episode (don’t expect the frequency of these to lighten up anytime soon), one where this idiot is tasked with supposedly the highest cases in the IRS’s coffers, and one which borders on stupidity. I think making Homer the wire for people with ties to him (Charlie, Mr Burns) was supposed to be a send-up of the IRS for being incompetent- why the hell would any agency send anybody with remotely close ties to these people under investigation? Still, to send Homer after the most wanted man in the IRS’s files sorta stretches belief. What’s worse is that this angle is largely dropped by the third act. By this time in the episode, it’s just Homer, Burns, and Smithers (because Burns and Homer are allies, you see) going to a foreign country- this time, Cuba. While the Cuba set pieces are a bit quirky, it’s largely just there to serve as a rushed resolution to the episode. To do so, pretty much every character in the show is mischaracterized, relying on “rule of stupid” to make the episode connect. Why didn’t Marge file taxes? Why does Marge not care about the fact that her husband aided and abetted a massive tax cheat? Why does the IRS hire an abject idiot to take on a high-profile case? 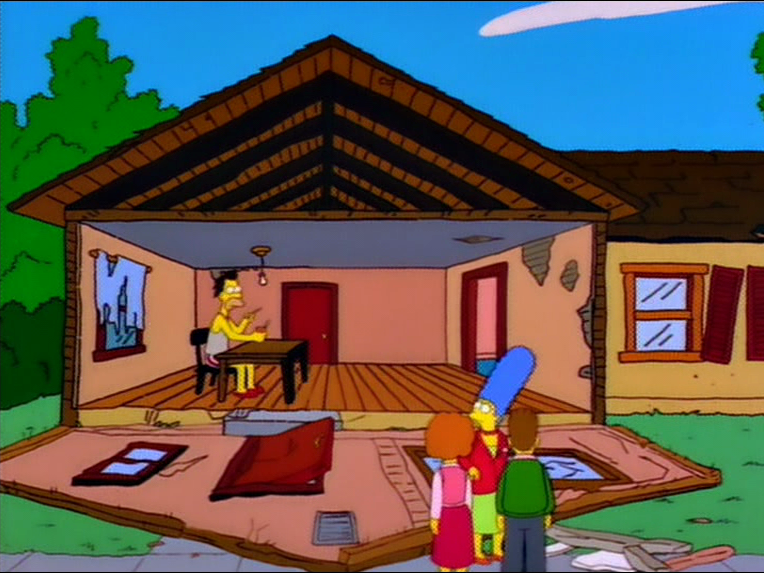 Why does Burns let Homer inside of his mansion? Why would Burns be so stupid to inform a magazine representative that he committed “grand, grand, grand larceny”? Each question just leads to further questions, collapsing in a vortex of stupid. Again, it’s a shame- this episode could’ve really taken a sizable bit out of the IRS and it’s patterns of behavior. Instead, we get a stock “escape” plot that relies on characters making decisions that don’t necessarily correspond to their personalities. This was the second episode written by Ian Maxtone-Graham, the first being “The City of New York Vs Homer Simpson”. In a 1998 interview, he admitted that he didn’t watch a single episode of The Simpsons before joining the staff, then proceeded to insult the fans. That’s a good sign of things to come. I’ll just add on this- Stuart Baird didn’t watch a single episode of Star Trek: The Next Generation before he went on to direct Nemesis. That movie proceeded to give a massive blow to the Trek franchise. Amazingly, I can understand why Lisa didn’t necessarily care that her father made off with a trillion dollars- it’s just a reminder that, as brilliant as she is, she’s still just a kid. Marge’s reaction is a bit more concerning- wouldn’t she be concerned that her father is now amongst the most wanted men in the world. Amazingly, the first act wasn’t too bad. Sure, there’s some cartoonish stuff (did Homer’s sedan literally flatten two cars? ), but there was enough comedy to offset it. Then Homer is sent to Burns’s mansion, and the comedy enters a steep decline. Ironically, as this review goes out, President Obama has announced a warming of relationships between the US and Cuba. Jerkass Homer Meter: 2. Homer gets a nice, cushy government job for egregious tax fraud. Nice. Zaniness Factor: 2. Homer, Burns, and Smithers. Three Americans, with a trillion dollars, effectively declaring asylum in Cuba. That is all. Score: 4.5. Not egregiously terrible, just bad enough to fail. Scullyfied Simpsons: Season 9, Episode 19: "Simpson Tide"
Synopsis: Fired by the Nuclear (“nuc-u-lar”) Power Plant again, Homer sees an ad for the US Navy reserve, and promptly signs up. His friends are convinced enough to sign up, as well. During the “war games” scenario, he is placed on a Nuclear (“nuc-u-lar”) sub. This can only end well… by which, I mean can only end in a Cold War revival, complete with the Soviet Union. Cue the Berlin Wall and the threat of nuclear (“nuc-u-lar”) disaster! Oh, and Bart gets an earring to try and be cool. Apparently, The Bartman is “so 1991”. Homer is not pleased. Review: This episode is an unusual one, indeed. It’s one of those episodes that I should loathe, but can’t bring myself to hate. Let’s face it: it has several traits that would become cliches of the Mike Scully era of The Simpsons. Homer gets a new job, becomes supremely respected by his boss (more than he should), has to take charge because his boss is an idiot, his friends join into his “scheme of the week” for no reason, the plot goes from “relatively grounded” to “street-rat crazy” at the flick of a switch, the progression barely makes any sense, and Homer gets off with a slap on the wrist for almost plunging the world into chaos. Oh, and the show dabbles in meta humor. Sounds like a trainwreck, eh? Actually, it’s pretty entertaining- one of my favorites from this (so far) otherwise mediocre season. As I implied in my “Principal and the Pauper” review, I am willing to reduce the weight of an episode’s flaws in my views if the episode is hilarious enough. Now, there are exceptions, but this episode is not one of them. I think that most of the reasoning behind this episode’s “funniness” would have to be rooted in the showrunners for this episode- Al Jean and Mike Reiss. While their era was not as zany as, say, the David Mirkin Era, they did distance the show somewhat from it’s domestic origins, allowing for wider swaths of characters to engage in a plot, as well as characters engaging in less “home-based”/more community-based plots. 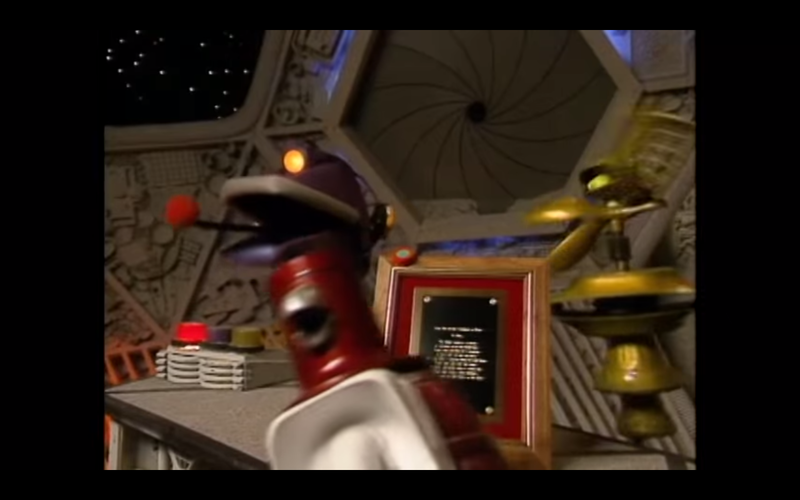 This episode just happens to take it to the extreme end of the spectrum, dwarfing Mirkin’s era in terms of zaniness. If anything, I’m a bit disappointed that this episode didn’t try harder with the jokes about the USSR- a sign of things to come. They could’ve made jokes about the fall of the union, the failures of central planning, etc. Instead, they chose to color by numbers- the Berlin Wall, Lenin, the tanks in Moscow, etc. Still funny, but a bit of a low-ball. Also, while Homer does progress quite far up the command for an “average joe”, this episode doesn’t exactly use him as a “pain magnet”- a trend in Modern Simpsons episode where Homer would suffer injuries, and walk away unscathed, going on to act like a Macho Sue idiot all the way. Plus, he does give up some of his hubris- he realizes that Bart getting the earring may have saved him in the long run. That, and it does make note of the influence of the media on modern conflict, what with the Channel 6 News Report pretty much calling Homer a traitor and a communist, followed by the USSR coming back. Or maybe it was just coincidence. Eh, still interesting. Oh, and character? A little bit mixed. I mentioned Homer and his dubious promotion to captain already. Captain Tenille? Funny, and pretty well developed, what with the relatively small amount of time given to the character. Bart? His rebellion by getting an ear piercing seems to harken back to his rebellious character, yet here, he seems desperate to “follow the leader” of Milhouse… yet failing epically. Maybe it’s a sign that his “rebel” character would be phased out in favor of a more “desperate” character. Sad. Still, the other characters did seem to be more than pawns in the adventures of “Captain Wacky”, as some have called post-classic Homer. Let’s see- if there were a few changes to the plot, if maybe some of Homer’s “progression up the ziggurat” was toned down, if maybe the flow was a bit better, if maybe characters didn’t materialise out of thin air (Smithers, anybody), this episode would fit pretty damn well in the Mirkin Era. Instead, I have to take it for what it is- a Scully-era episode (not a Scully episode) that worked pretty damn well, given that I laughed through it. A rare breed, indeed. OK, there was one clever reference to the USSR. When talking about his experience in the Navy, Abe references JFK, and a comment that made his sailors think that he was disloyal to the Allied Forces. Who else was president when tensions between the USSR and the US reached a fever pitch? “I’d like to get my ear pierced?” “Well, better make it quick, kiddo. In five minutes, this place is becoming a Starbucks!” That is all. Admittedly, I can excuse some of Homer’s promotion by a line that indicates that Captain Tenille has some Navy-related trauma. One last note: due to personal matters, the review for “Blendin’s Game” might not go out until next weekend. I apologize in advance for the long delay. Favorite Scene: OK, I’ll bite: the scene with Tenille getting shot out of the torpedo tubes was a brilliant piece of dark comedy. 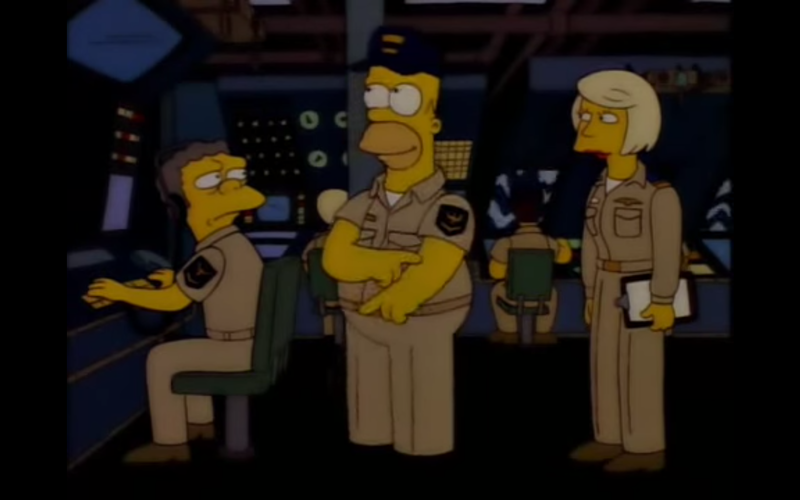 Least Favorite Scene: I still can’t buy the Village People actually singing “In The Navy” while on a submarine, plus Smithers, plus the sub going underwater while they’re all still outside. That was a tad too dark for me. Score: 7. Again, given mainly for the comedy. Scullyfied Simpsons: Season 9, Episode 18: "This Little Wiggy"
Synopsis: After noticing that Ralph is constantly bulled due to his “off” character, Marge arranges a meetup between Ralph and Bart, much to the latter’s chagrin. As Bart realizes the power his father lords as the chief of police, such as having the master key, Bart begins to use Ralph to break into various places, like a toy store, a bakery, and a local jail. Review: If ever I were to pick the best “valentines day” episode of any show ever, it would probably have to be “I Love Lisa”. Not only does it have a simple yet compelling story between the ditzy yet soft-hearted Ralph and the intellectual yet occasionally aloof Lisa, but it also showcased that Ralph was more than just a prop character, a “kid in the back”. He was a loner, ostracized because of his ditzy behavior, yet was an utter savant when it came to the stage. 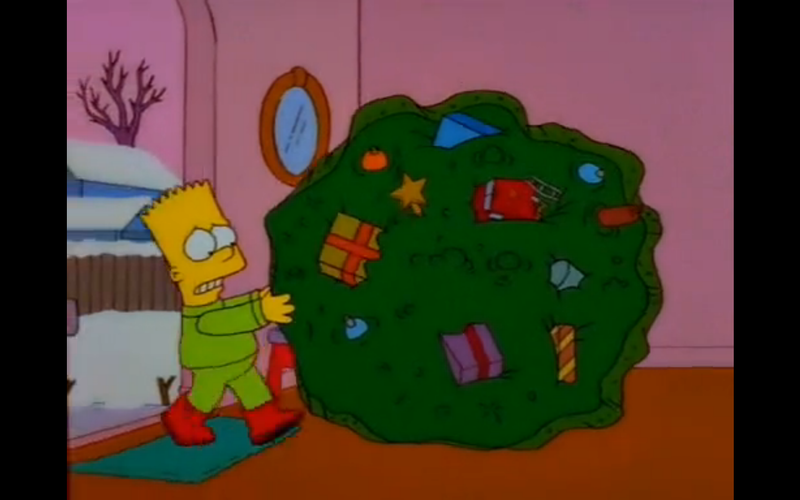 It’s probably my favorite “holiday” episode of The Simpsons by quite a margin. If ever you need proof that the classic seasons of The Simpsons were able to craft some of the most fantastic characters in TV history, watch that episode. Scullyfied Simpsons: Season 9, Episode 17: "Lisa the Simpson"
Synopsis: After Lisa fails to solve a brain teaser that the other students got instantly, a series of unfortunate events (such as a diorama) begin scaring Lisa about the quality of her intellect. Grandpa eventually tells her of a trend that various Simpsons have, where their intellect declines over the years, calling it a “Simpson Gene”. A frightened Lisa tries to fight back against the suspected decline, only to fear that she’s becoming lowbrow and low-class. Review *SPOILERS*: Is it possible for one scene to make an entire episode just seem mean spirited? It’s a pretty damn hard feat, but “Lisa the Simpson”, which seems almost perfect, just contains one little scene that drives me spare. Yes, it’s a Lisa-centred episode. 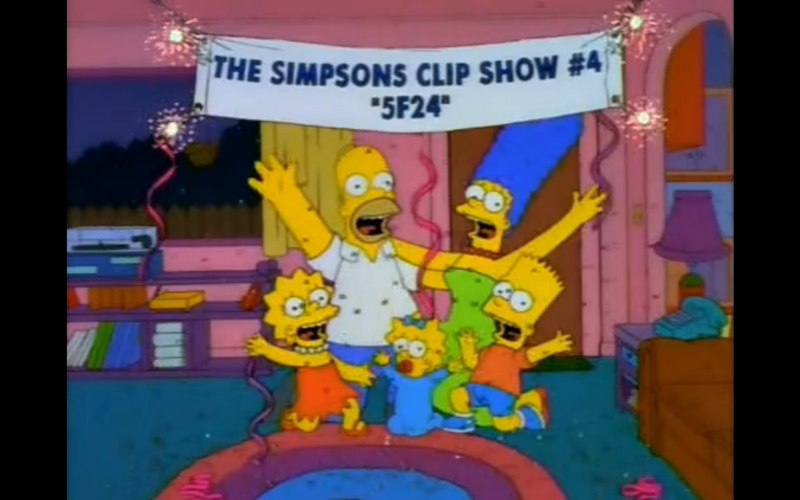 Some of the best Lisa-centred episodes focus on her relationship within the clan of The Simpsons: she’s probably the most down-to-earth of the group (Homer and Bart are Homer and Bart, and Marge is occasionally spacey). Even so, she’s portrayed as a bit aloof, reserved with her intellect in the dumb town of Springfield. So, an episode that seems to take her down a peg, show that she can still fall into the same traps as the rest of the town? That’s a good idea. We did see her take up an angry activist moment in “Lisa the Vegetarian”, where, in pushing her beliefs via pig-napping, made her little better than Homer “You Don’t Win Friends With Salad” Simpson himself. However, to see this normally intellectual character enter a period of self-doubt, thanks to family coincidence… that makes for an entertaining episode. And, for the first two and a half acts, it is a very gripping episode. Having Lisa deal with the fact that she might be damned to the same amounts of insolence as the rest of the town of Springfield is surprisingly emotional. You see, she was slipped up by a mere brain teaser that the rest of the kids got in seconds. Is she overanalyzing the brain teaser? Maybe. It’s Lisa Simpson: in a town of the average joes, she’s the one who looks too deep. That’s a really creative way to show that a character that’s normally an ace has her human flaws. Led on by, well, Grandpa about Simpson history, and taking on more activities with Homer and Bart (i.e. watching When Buildings Collapse on FOX), Lisa enters a state of resignation, submitting her brain to “one last meal” at the Springsonian and the Jazz Club. It’s actually pretty damn emotional to see her try and fight, even going as far as to make a futile attempt to plea to the town of Springfield to increase their horizons. She knows it’s futile. She just needs to be heard. Of course, there was the ending, where Homer brought in several of his relatives. It rotates between hysterical and heartbreaking, depending on what mood you’re in. The context of Lisa’s worst fears being confirmed truly contrasts with Homer’s relatives describing their careers as “I step in front of cars and sue the drivers” and “Jug Band Manager”. It’s truly fantastic. Then the real ending happened, and I wanted to chuck my DVD out. You see, Homer only brought in the Simpson men: the women are fantastic successes. Why? Well, apparently, it’s genetic: the “Simpson Gene” is apparently only carried on the Y chromosome – thus, only men are affected. Translated: Simpson men are damned to be idiots, while women? Raging successes. Let’s ignore that Herb Powell was a raving business success, who was only failed by the American buyer, who wanted everything in a car, yet wanted the design to take few risks (and to not have it cost $82,000). Let’s ignore that Abe is a fantastic military strategist, who is held back by his senility and his desire for a more active life getting the better of him. Let’s ignore that Homer has flashes of great intelligence, only held back by a weak upbringing and years of alcohol consumption. Let’s even ignore that Bart could be fantastic at anything– he merely has a short attention span, and maybe some other learning disability. Nope, now all Simpson men are just idiots. Yup, this is apparently a happy ending. Why? Lisa was validated. Look, I’ll get this off my chest right here and now: I am pretty pro-feminist (and yes, I am a male). I support equality of the sexes, I am in full support of the advancement of women’s rights, the objectification of women or the reduction of them into mere tools drives me up the wall, I feel that America (and to only a slightly lesser extent, the rest of the world) has quite a way to go when it comes to neutralizing sexism and objectification of women, and I feel that there is a dearth of well-written characters who are also female. That being said, in my opinion, this ending is less a testament to feminism and more outright misandristic. Basically, Homer and Bart are openly told that, because they are male, they are basically damned to failure. Yet, this is a happy ending. Why? Well, Lisa can solve the damn puzzle. I’m just hoping that the scientist that told Lisa about the truth about the gene was just lying to save Lisa’s sanity. Even then, the fact that the men are presented as idiots yet the women are presented as successes still comes off as a bit sexist, eh? It’s a sign of things to come: later seasons of The Simpsons have had troubling gender-related politics, trying to present itself as a feminist, progressive show, when in reality, creating female characters that were little more than props or satellites for other characters. I don’t really know what to think about the main plot. As good as most of it was, the ending just threw me. Even the very last two lines in the episode can’t really save the ending for me. It’s a major dent in the quality of the episode. Oh, and Jasper gets trapped in a Kwik-E-Mart freezer, and Apu and Sanjay turn the mart into a tourist trap. It’s a pretty good subplot. This is the last episode not produced by either Mike Scully or Al Jean in some form (until Season 22-ish), and the second to last one for four years to not have Scully at the helm. Eh, can’t always end on a high note. This episode was also written by Ned Goldreyer. He did some work on the UPN’s adaptation of Dilbert, one of the most underrated animated sitcoms of all time. Give Dan Castellaneta credit: the fact that he can do all of the voices of the male Simpsons? No wonder why he’s getting about $300,000 a year as of late! Oh, and I apologize for the long hiatus/vacation. For some reason, I just couldn’t motivate myself to put something down on paper… that, and there was that Simpsons marathon on FXX. Also, Gravity Falls will be back in September. I might be able to put down a few more Scullyfied Simpsons episodes… or, I might return to Red Dwarf. Maybe. Zaniness Factor 1.5. Having an old guy survive a freezer? Eh, not stupid. Favorite Scene: Lisa’s plea to the town of Springfield really shows the power of the writing this show once possessed. It’s gut-wrenching, funny, awesome… it’s just sublime. Least Favorite Scene: The ending, though, just left an awkward taste in my mouth.